From the dark corners of Norway, the beast has surfaced. 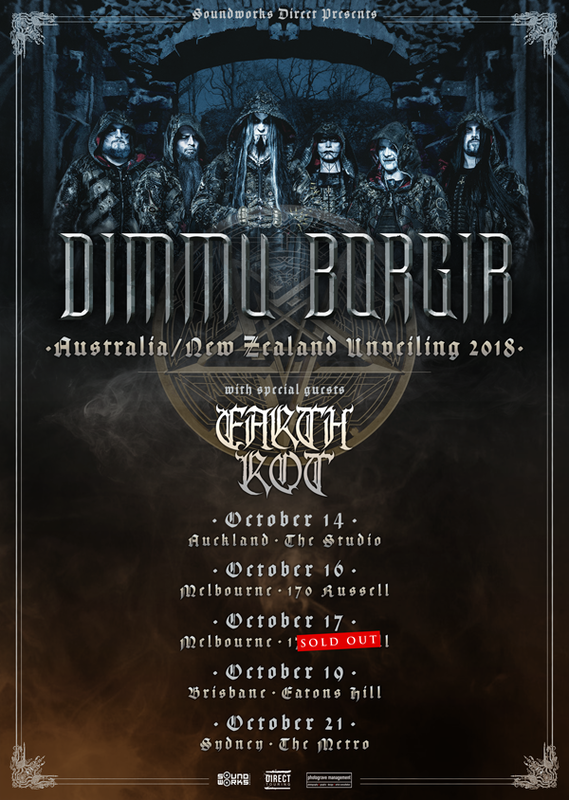 After 25 years, the world's biggest black metal forge, DIMMU BORGIR, invades Australia & New Zealand for their first ever headlining tour. Casting shows that will viciously attack your senses whilst pushing them to their ultimate limits and showcasing the might and power of one of the most influential acts of the genre. Australia's blackened death metal machine EARTH ROT have landed the main and only support for the massive upcoming DIMMU BORGIR tour in October. With an old-school undercurrent and a sense of grim relentless groove. It is hateful, harmful, sinister and melancholy noise shaped by the world around you. Since the early stirrings in 2014, EARTH ROT have pulled no punches, recording, releasing and touring at full speed across Europe, Australia and Asia and show absolutely no intent of slowing down.